Now there’s a fitting entrance to a trophy home. 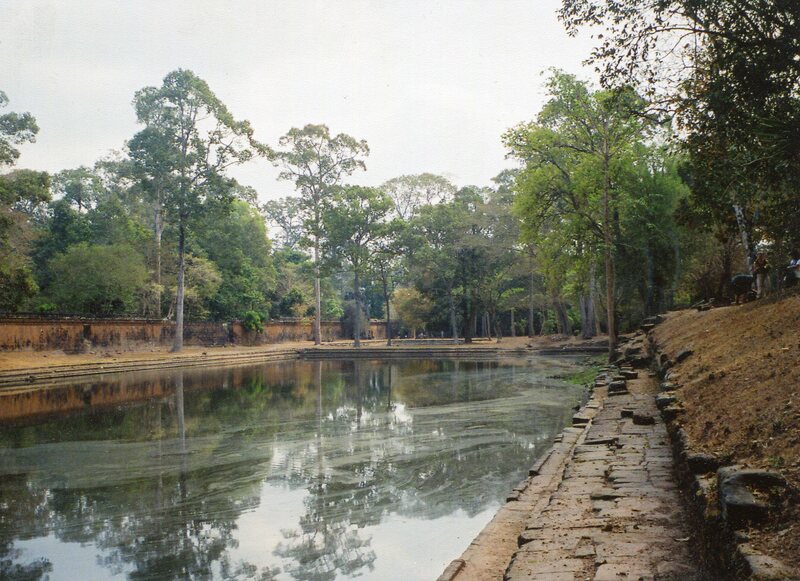 For the Khmers at Angkor, it was the ultimate trophy home, the royal palace. 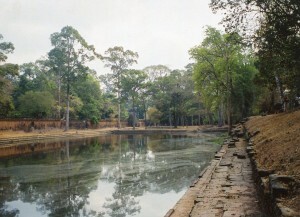 In its day, it was the largest palace in Southeast Asia. Approach those steps with respect! The palace presided over the Elephant Terrace. In the last post, I ogled over its nearly 1,000 foot frontage. But that was one of the palace’s short sides. The big man’s home was surrounded by a laterite wall more than 1,600 feet long, 750 feet wide, and 15 feet high. 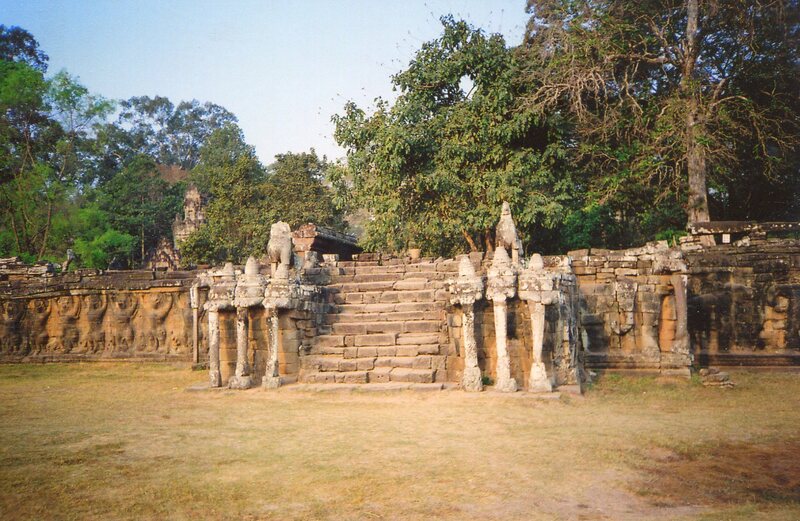 The above monument, Phimeanakas, was a royal cult temple in the center of the compound. The other buildings within the walls were wooden and are thus long gone. 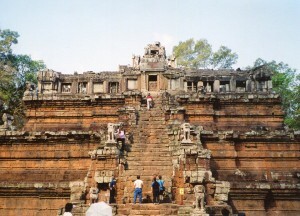 Above, you can see the other remaining building, the east gopura–a gatehouse that stands on top of the Elephant Terrace. The forest and a few stray dogs claimed the rest of the compound. But a pool, 492 by 164 feet, still spreads out. At least 4 other baths sparkled within these walls. They might have been used for both ritual cleaning and pleasure. 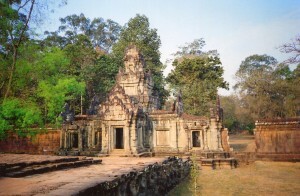 Three to five thousand dancing women or concubines are supposed to have lived within the compound. If they frolicked in the waters, they must have seemed like visitors from the celestial realms. Zhou Daguan wrote about seeing the king at the end of the 13th century. Court life seems to have been very stilted. The monarch gave audience twice a day. Servants blew into conch shells to signal his arrival, and he appeared in a golden window. Two women pulled a luxurious curtain back to reveal him grasping the sacred sword, and all had to put their hands together and bow to the ground. They could only raise their heads after the conches went silent. So, the Khmer court seems very heavy-handed–at least at the end of the 13th century. The king was considered to be the center of the world’s order, so his home wasn’t a casual place to hang out. But it sure glittered. Linger there today, and you can imagine splendor that rivaled Angkor Wat’s. You can see more in the post about the Suor Prat towers on the other side of the parade ground. 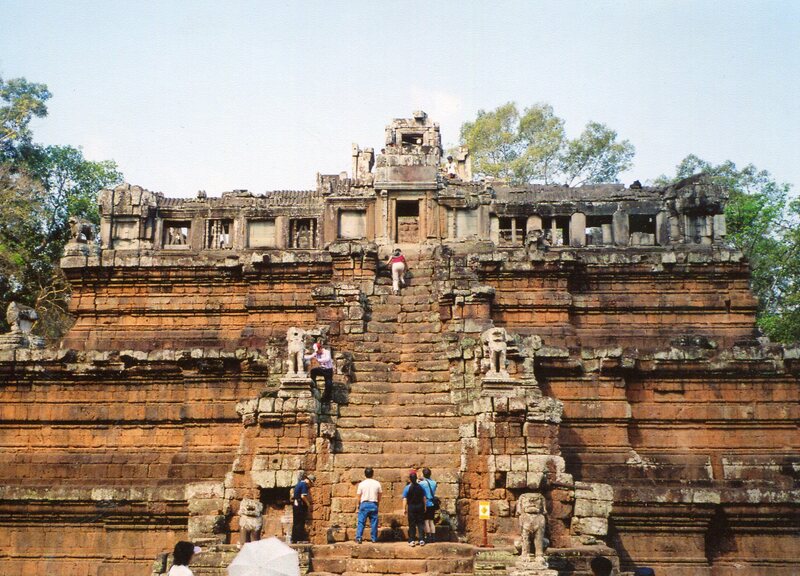 While Daguan resided in Angkor, the Thai kingdom of Sukhothai was growing, and its royal court formed a striking contrast with the Khmers. There’s endless variety in Southeast Asia.